Phoenix is home to world-class medical institutions and hospitals. 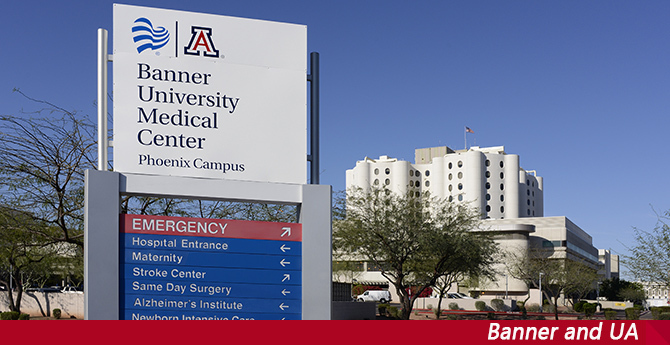 The UA College of Medicine – Phoenix is partnered with nine clinical affiliates, anchored by Banner Health, our primary clinical partner since 2015. Our students have the opportunity of training at each of the nine locations and interacting with more than 1,000 leading faculty as part of our affiliated partnerships. Phoenix Children’s Hospital is the primary pediatric affiliate for the University of Arizona College of Medicine – Phoenix. Phoenix Children’s Hospital is recognized as one of the country’s best destinations for pediatric medical care, innovative research, and education for the next generation of pediatric specialists. Its new 11-story, 750,000-square-foot tower makes it the largest freestanding children’s hospital in the Southwest. The UA College of Medicine – Phoenix is the principal academic affiliate for Phoenix Children’s Hospital. Founded in 1895, St. Joseph’s Hospital and Medical Center was the first hospital in the Phoenix area. A 607-bed, not-for-profit hospital that provides a wide range of health, social and support services with special advocacy for the poor and underserved. It includes the internationally renowned Barrow Neurological Institute, the Heart & Lung Institute, Adolescent Center and a Level I Trauma Center verified by the American College of Surgeons. St. Joseph’s has a robust program of clinical trials and research that will compliment the University of Arizona Cancer Center, which is expanding to Phoenix in collaboration with St. Joseph’s. The Valley Fever Center of Excellence, based at the UA in Tucson, also is expanding in partnership with St. Joseph’s. Maricopa Integrated Health System is a University of Arizona College of Medicine – Phoenix clinical affiliate. MIHS includes Maricopa Medical Center, the Arizona Burn Center, the Arizona Children’s Center, the Comprehensive Healthcare Center, the McDowell Healthcare Clinic, 10 community-oriented family health centers and an attendant care program. For more than 40 years, Abrazo Central Campus (formerly named “Phoenix Baptist Hospital”) has been an acute care facility and teaching hospital, providing care to patients in the Phoenix community. The hospital is recognized for cardiovascular care, orthopedics, breast health, women’s services, radiology and 24-hour emergency services. HonorHealth is a leader in personalized care and puts you at the center of everything. We're exploring new ways to give you access to the right care, as easily as possible, resulting in more complete, coordinated care. That's also why we offer more than hospital care — we bring care to where you live, regardless of your need. Our services include Heart Care, Orthopedic Services, Cancer Care, Emergency Services, Trauma Care, Maternity Services, Pediatric Services, Diabetes Management, Home Health Services, Neurosciences, Medical Imaging, and Outpatient Services. Our partnership with the College of Medicine includes a Family Medicine Residency program. Students are instructed and can choose elective rotations at the Scottsdale branch of the renowned Mayo Clinic. In Arizona, Mayo Clinic serves more than 90,000 patients each year with an integrated, team-based approach. The clinical practice is focused on adult specialty and surgical care in more than 65 medical and surgical disciplines, supported by outstanding programs in medical education and research. The Scottsdale campus, which opened in 1987, includes the Mayo Clinic Building, the Samuel C. Johnson Research Building and the Mayo Clinic Collaborative Research Building. The Phoenix VA Health Care System is comprised of the Carl T. Hayden Veterans Affairs Medical Center and seven clinics, serving more than 80,000 veterans in central Arizona. The VA Medical Center provides acute medical, surgical, and psychiatric inpatient care, as well as rehabilitation medicine, and neurological care.